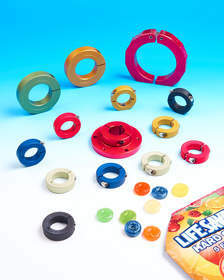 WILMINGTON, MA--(Marketwired - Mar 2, 2016) - Stafford Manufacturing Corp. has introduced a line of anodized aluminum shaft collars and mounting devices that are offered in permanent bright colors to enhance the appearance of products, equipment, and machinery. They also increase safety by color-coding switches and fittings. Stafford Anodized Aluminum Shaft Collars and Mounts provide OEMs and system designers with the ability to select and custom match colors to enhance the aesthetics and branding of their products, equipment, and machinery. They also permit the color-coding of switches, fittings, and replacement parts which is especially effective for fail-safe or critical applications. Functionally equivalent to standard clamping collars, Stafford Anodized Aluminum Shaft Collars and Mounts are available in sizes from 1/8" to 6" I.D. with smooth bores to protect shafts, tubes, and pipes. Featuring one- and two-piece, and hinged styles, collars also can incorporate flange mounts and special bores, face, and O.D. treatments such flats, holes, and knurls. Founded in 1975, Stafford Manufacturing Corp. is a leading manufacturer of shaft collars, couplings, and specialized mechanical drive and structural components. In fact, the company well recognized as a single source for all types of shaft collars and shaft couplings including metrics. Their "Standard Series" features over 300 popular items which are in stock for immediate delivery, their "Signature Series" features premium quality collars and couplings manufactured in the USA, and their "Solution Series" with over 500 problem-solving components is a virtual mechanical design center for anyone involved in product and system development. In addition to their over 3,300 catalog parts, Stafford Manufacturing manufactures problem-solving parts for leading OEMs, contract manufacturers, and numerous industrial distributors. Their well-engineered design solutions can be found in all types of equipment including conveyors, packaging machinery, processing equipment, recreational products, medical instruments, and consumer goods. Stafford Manufacturing is ISO 9001:2008 Certified. Stafford Anodized Aluminum Shaft Collars and Mounts are available in sizes from 1/8'' to 6'' I.D. with smooth bores to protect shafts, tubes, and pipes.